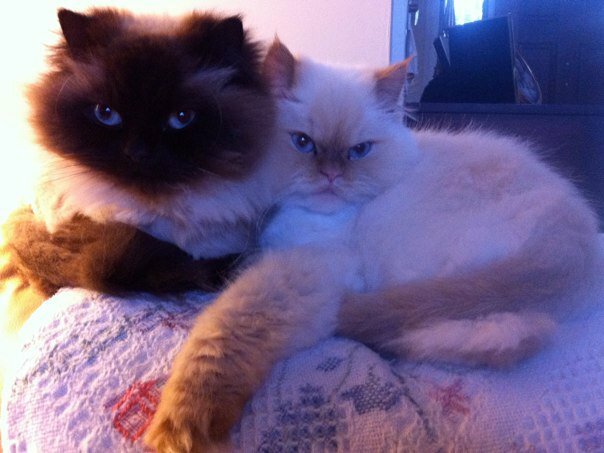 Our Persian and Himalayan kittens adopted in 2009 are featured on this page, as well as comments and pictures that have come from their adoptive families. Families are free to send pictures or give updates on their babies. We have a unique and special relationship with most of our adoptive families. We feel very blessed that our kittens have been adopted by these very special families. Enjoy their cute and sometimes very funny stories. You may click on the picture to see additional pictures of the kitten or view the slide show provided to see the kitten when it was growing up at the Cattery. You can click on the families pictures to enlarge the size of the picture. Calla Lily is a Flame Point Himalayan. She has beautiful perfectly round large light blue eyes in an adorable doll face. She loved to purr and run up to you and be cuddled. Her fur was very full and long. Her fur is absolutely gorgeous. She is a real sweetheart and loves to mother her siblings and the cattery's small dog. She is the mating of Petunia Lilymae and Lord Chesterfield the First. Adopted on November 6, 2009 by her loving forever family, Heather, Austin, Dawson and Alex. She is very much missed by everyone at the Cattery. We look forward to seeing new pictures of her as she matures and her coloring becomes mature. 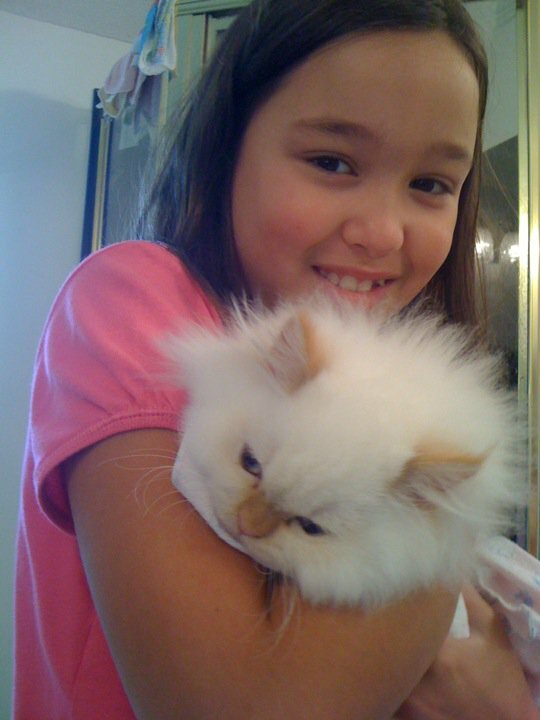 January 19, 2010: As per Heather, Calla Lily's mother, Calla Lily had her spay surgery in January 2010. When Heather brought Calla Lily to the veterinarian for her spay surgery, Heather said the vets first words, upon seeing Lily, was how beautiful she is. February 4, 2010: As per Heather, "Calla Lilly is doing very well. ... She seems to be fearless! She is doing great and is spoiled rotten. She sleeps on a pillow right next to my head. She is still a little purr box and we all love her very much. ...The techs and vets were all gaga over Lilly! They said she acted like she owned the place when she stayed 2 nights after her surgery. She has such a great personality". 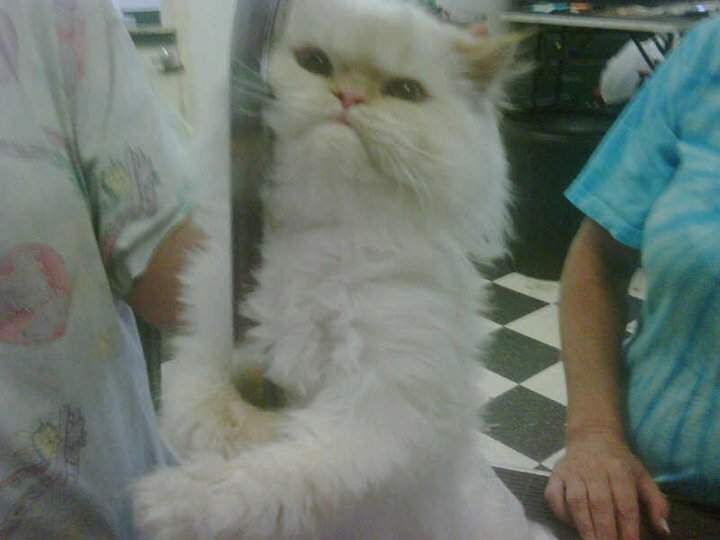 January 20, 2011: Per Heather on Facebook About Lily's Picture on the Pole: In this photo: "Lily has another " job" as a pole dancer!! I think I'll take her to Vegas! Darlene took this pic at A Bundle of Love Pet Grooming! She (Lily)had been once before. Darlene only grooms a select few cats due to biting and scratching! She grooms Alex and Lily for me. She loves them. What is so ironic is Lily has recently become obsessed with water here at home. If I go near a sink or bathtub, she meows very loudly and wants me to run some water for her. She loves to try to catch it in her mouth as it is running and it is hilarious!" Victorian Gardens Calla Lily with her lion cut. Another gorgeous picture of Calla Lily after an exhausting time of decorating the Christmas tree. You can't tell that she is spoiled rotten. 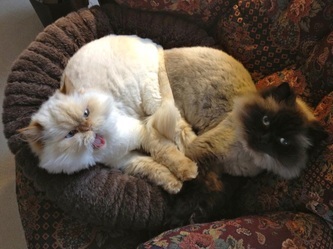 She looks like a lamb with her lion cut. She truly is precious. Thank you Heather for taking the time during this busy season to share this adorable picture with us. Recently Heather, parent to The Perfect Calla Lily (Flame Point Himalayan), sent us this pic and comments via Facebook. 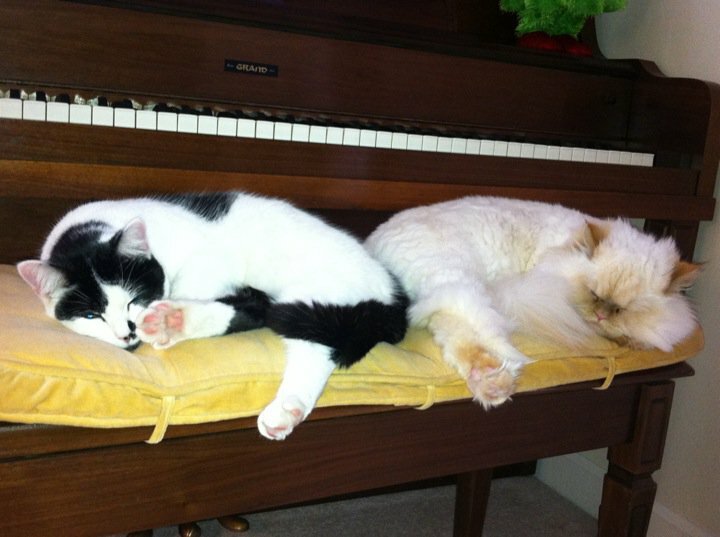 "They are both resting in this pic. Lily cleans Alex more often than he cleans her. They are both fixed, but Alex tries to go through the motions and he massages Lily's back-hilarious!! She has enough when he tries to bite her neck! 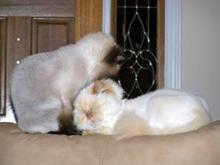 They have what we call "kitty smack down" all the time. They wrestle and chase each other all through the house. It sounds like a herd of elephants. Lily is even more obsessed with water now!" Thanks Heather for updating us on these cute love birds. They are both pictured here in their lions cut. "She is a true joy and we love her so much! Alex loves her too. They sound like a herd of elephants chasing each other all over the house! They are snuggle buddies too! You and your business, Victorian Gardens Cattery have been a blessing to us. We are so thankful we found you and our precious Lily!" You have to wonder what our precious Calla Lily is dreaming about from this picture. It is a picture of pure innocence. I am sure Heather would laugh at that because is she so innocent? Heather, Calla Lilies' mother, is a lover of all animals. I think if Heather could, she would have a houseful of them. She is just one of those lovely people who shows compassion and empathy to all animals, including rescues. Calla Lily was the first Flame Point we produces at our Cattery. Lily is now 3 1/2 years old. 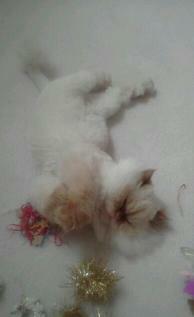 Calla Lily has the cotton fur coat so Heather lets her have a lions cut haircut. There is one picture of her with her full coat in the Adopted Kittens page. She looks fab in it. She looks so much like her sister Buttercup except for the color point color. She was born in Petunia's first litter. 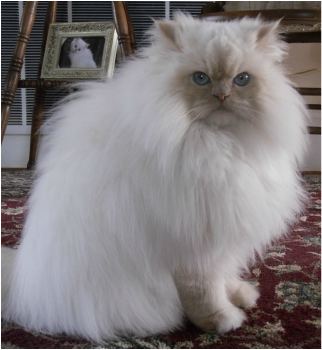 There father is Lord Chesterfield, a large boned extreme faced Red and White Persian. 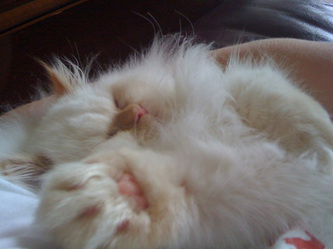 She is Buttercup and Primrose's sister. 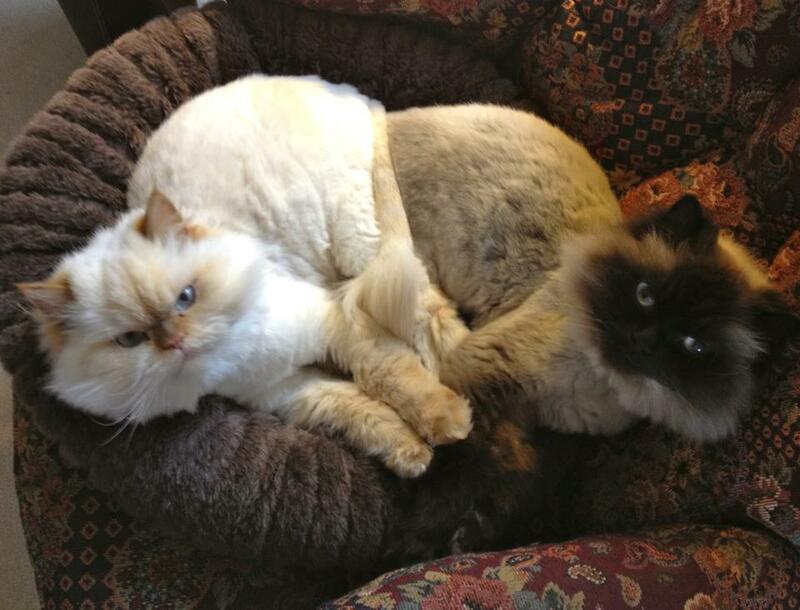 Her companion in Heather's home is Alex, a Seal Point Himalayan who is related to her. Petunia and Alex have the same parents. Alex came from the breeder from whom we got Petunia from. Heather sent us some pictures of The Perfect Calla Lily from Facebook. 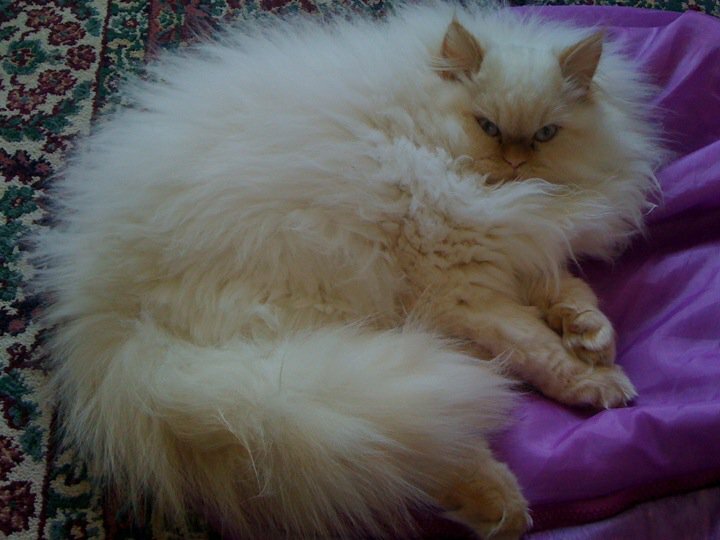 She is a Flame Point Himalayan from our first litter in 2009 between Petunia Lilymae (Cream Point Himalayan) and Lord Chesterfield the First (Red and White Persian). 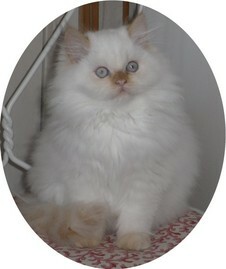 She is also the sister to The Perfect Buttercup (Cream Point Himalayan) and The Perfect Primrose (Cream Persian). 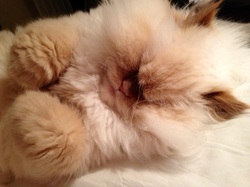 Here is a quick note from Heather: "The way her fur grows on her face makes her look mad sometimes! She is a sweetie and is obsessed with water. Every time I even walk near a faucet, she meows like crazy. She comes flying into the kitchen when she hears the ice dispenser!" Comments on photos from Heather. Thanks Heather for these great pictures. I love the Thin Mints Picture! What a character she is. 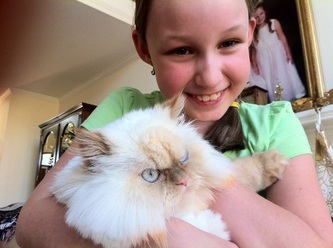 Buttercup has beautiful blue eyes in a traditional or classic doll face. Her eyes matured and darkened up and now change from a medium blue to a vivid dark blue, depending on the lighting and the time of day. She has a medium frame. Her baby/kitten fur was one of the fullest and longest we have every seen in a kitten. At six months old, her fur on top measured 6" long. She still has a huge coat in the winter time that measures approximately 1 foot wide from side to side. Her personality is precious and she is definitely a character. She loves teaching all the new babies her bad habits like playing in the water or being a diva and cleaning her paws in the water. One of her cutest things to do is grab a toy mouse in her mouth and start playing with it growling or walking around the house with it in her mouth in a low growl. We don't know where she learned that from, but it is adorable. She is remaining at our home for us to enjoy. We can not bear to part with this loving beauty. If you click on her picture, you will see additional pictures of her.